Categories: Business, Jonathan Gifford, Sales. The best way to secure yourself against being ‘let go’ in the modern economy is to rise to a level within the corporation where you are making the strategic decisions, not bearing the brunt of their consequences. It may be tough at the top, but it’s dangerous in the middle — and the rewards at the top are far greater. 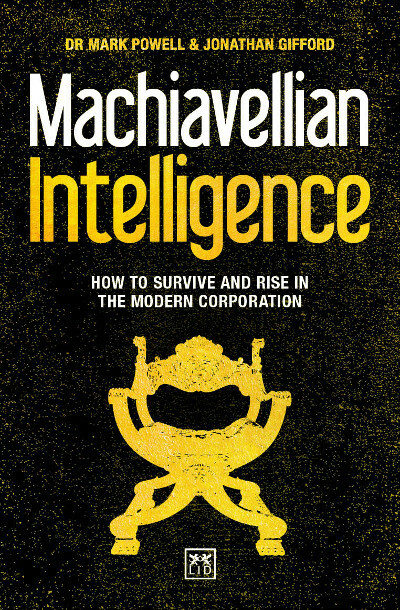 Machiavellian Intelligence argues that many intelligent and hard-working professionals with good leadership skills fail to maximize their career potential because of a number of instinctive ‘good’ habits – things that make them highly effective executives, well-liked and respected by their colleagues, but which are not best designed to take them to the very top of their chosen career. Jonathan Gifford is a business author whose writing focuses on the human aspects of business, management and leadership and on the lessons that business can learn from history. His books have been translated into Chinese, Korean, Thai and Indonesian. Jonathan studied philosophy at the University of Kent at Canterbury and spent the early part of his career in advertising sales and management with various national newspapers, including the Guardian, the Sunday Express and the Mail on Sunday. He later moved into magazine publishing with BBC Magazines and was the launch publisher in 2000 of the award-winning BBC History Magazine. He is the co-founder, with Dr Mark Powell, of The Human Energy Organisation. He lives in Oxfordshire with his wife and children. Mark Powell is a partner at A.T. Kearney consultancy and Associate Fellow at the University of Oxford’s Said Business School. Jonathan Gifford is a business author and partner of the digital advertising agency Bluequest. He also lectures in marketing at the European Communication School.